Large Land Mammal: TIMC: "Fiction Family grants musician new outlet"
TIMC: "Fiction Family grants musician new outlet"
Let's say, for the purposes of illustrating a point, that you're a musician from Southern California. You've paired with like-minded musicians in pursuit of something a little different for a season. You make a record, you release said record and you decide you want to tour for said record. What's the first thing you do? Why, travel through the frigid northeast in a van acclimated to life in much warmer climes, of course. "These are actually the best roads we've seen in a long time," says Jon Foreman, who with guitarist Sean Watkins is traveling as the new collective Fiction Family, in an interview on the road between New York and Boston. "It's been kind of like a winter wonderland tour, with Michigan and Chicago having record low temperatures all the way across." 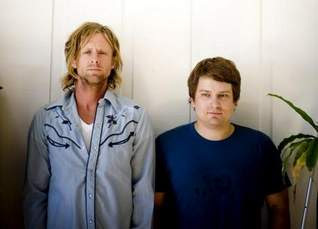 The Fiction Family project takes Foreman, known by most as the front man for Switchfoot, and Watkins, the rock-solid guitarist for Nickel Creek, out of their musical — and for now physical — comfort zones, giving both a chance to refresh and stretch themselves while their bands are on hiatus. Even though Foreman and Watkins are both from the San Diego area and live about 10 minutes from each other, there wasn't much interaction until their bands played a festival-type bill in the city. Numbers and e-mail addresses were exchanged, as well as song ideas, and a new creative partnership formed, albeit slowly. "The whole process took a long time because we were both on tour and we had no ambition of really doing anything with it," Foreman says. "We were making it song-by-song just for fun, and maybe we'd put it out some day as an EP or just give it away for free. But the whole impetus was just making the music itself." The tracks on the self-titled Fiction Family debut amble along the acoustic spectrum, a much farther cry from Switchfoot's output than Nickel Creek's. They range from the poppy, XTC-reminiscent first single "When She's Near" to the stark, noir-esque "Betrayal," the first song the pair completed. The songs also gave each musician a chance to play one role at a time in the creation process. "The second song we did together, called 'Out of Order,' (Sean) pretty much wrote on his own and I provided more of the producer role," Foreman says. "That's a good example of how we both wore different hats: When one of us was producing the song, it allowed the other to dive more into the artistic elements of the song, and vice versa." And so, with a project under their belts that emerged primarily and simply because it could, Fiction Family is on the road, together with drummer Aaron Redfield and bassist/keyboardist Tyler Chester. Foreman says, after a decade-plus within the framework of Switchfoot, that he's enjoying the challenges of creating a band persona from a clean slate. "There's a great chemistry and a real friendship because of where we're coming from, but I'm thankful for that," Foreman says. "Switchfoot is a band of brothers and we're all friends, but to start a new band, you don't know what the vibe is going to be like. "It keeps all of us on our toes, and it's something I've kinda been looking for — musical sparring partners to push all of our techniques and abilities."